Summer is around the corner. The weather has gotten warmer and the sundresses and the flip flops have come out to play. This is one of my favorite things about Summer. The fact that I can easily slip on a sundress and flip flops and be ready to go out for a barbecue or trip to the beach. 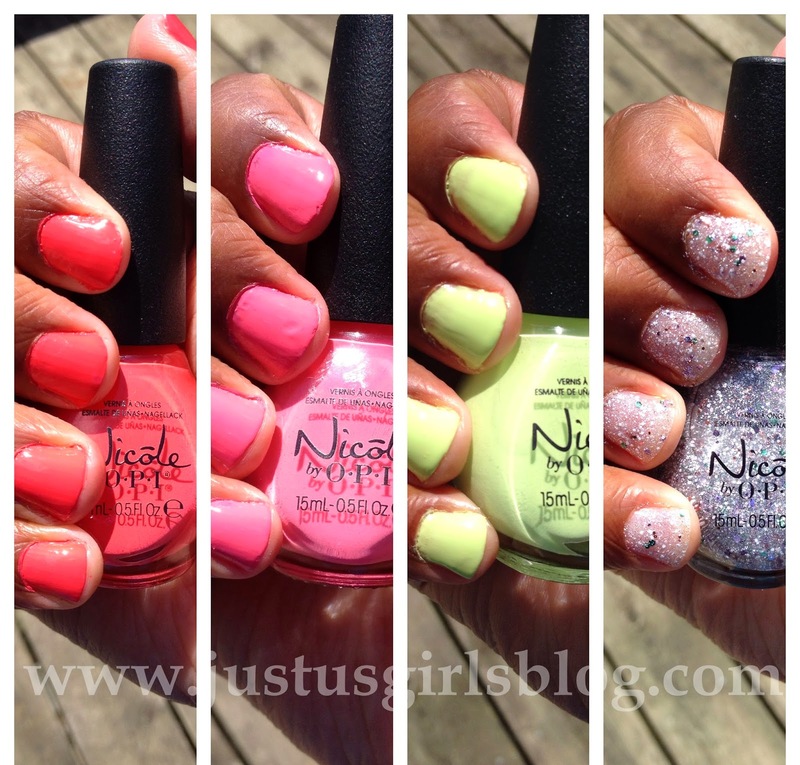 I recently had a chance to try Nicole by OPI's latest collection, Seize the Summer! The collection has four bold and beautiful colors that are just perfect for you to wear this Summer. This citrusy green is the limiest… and that’s the truth. Although all the lacquers are very beautiful, I have to say my favorite has to be Shaved Nice (glitter). Not only is it easy to apply, you don't even need more than one coat. You also can wear it with or without a top coat. I love that it can go with anything you have on and would be perfect throughout the entire year. Lay it on the Lime (lime green) is very bright ad screams Summer when you put it on. Neon colors are very big right now, this is definitely a great lacquer to wear. It took about four coats for me to get the right shade and look I wanted ,but I was very pleased with the outcome. LeaPink For Joy (pink) is another color that screams Summer. It's very bold and bright, which works out perfect for this time of year. It took about three coats for me to get the right color I wanted, but I was very pleased with how the look turned out. I would suggest for both the Lay it on the Lime and for LeaPink For Joy that you add this over a coat of white so that it shows up better and so you don't have to add too many coats to get the shade you want. Lastly, The Coral of the Story (red). Definitely another favorite of mine from this collection. I love that I was able to only add two coats before I was very satisfied with the way it looked. The polish went on very smooth and looked perfect for the warm weather. Nicole by OPI Seize The Summer Collection will be available starting June 2014. They retail for around $10.99 and you can find them at the following retailers: Shoppers Drug Mart, Walmart Canada, Loblaws, Rexall and London Drug. Disclosure: All opinions are my own. I received samples from the new Seize The Summer Collection at no cost for the purpose of this review. No other compensation was received.